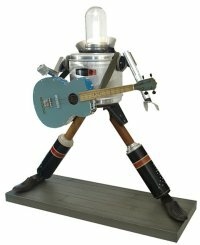 Artist Toby Atticus Fraley has lovingly handcrafted these robot sculptures from various junk that most of us wouldn’t have second thoughts when throwing them away, and they will not only spruce up the dreary condition of your living room, but light it up as well. Each of Toby’s creations are unique in their own sense, and have their own personality to boot, although you will find that old picnic coolers and vacuum cleaner parts form the majority of the body parts. Sizes vary as well, ranging from 28″ tall all the way to 58″ in height. These pieces of techno-artwork won’t come cheap though, as prices hover between the $1,800 and $1,900 points.